The Mane Objective: Giveaway! Giveaway! 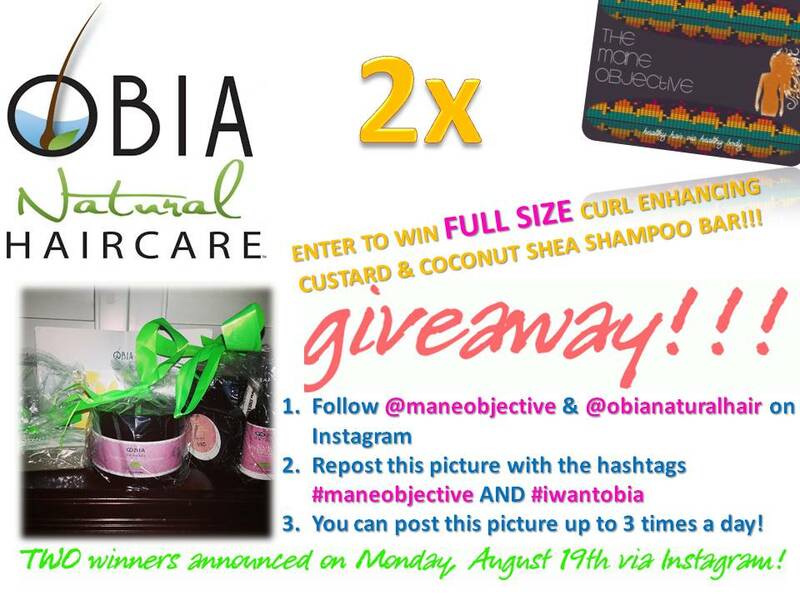 Enter to Win FULL SIZE Products from Obia Natural Hair Care!!!! Giveaway! Giveaway! 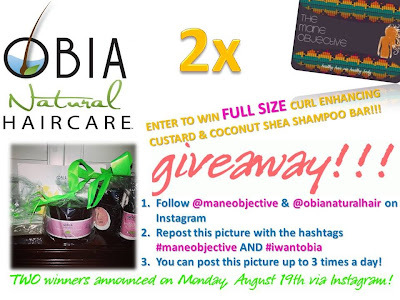 Enter to Win FULL SIZE Products from Obia Natural Hair Care!!!! You guys already know I adore their products. Now thanks to Obia herself, TWO lucky winners are going to get some Obia Natural Hair Care products of their own!!! More specifically, two folks will be getting BOTH of my faves: the Curl Enhancing Custard AND Coconut Shea Shampoo Bar! These products are AMAZE-BALLS!!! Don't believe me? Check out the review here. 3. You can post the picture up to 3 times a day! The WINNERS will be announced on Monday, August 19th via Instagram!!! Don't have Instagram? It's all good. Just "Like" The Mane Objective Facebook Page , share this post and tag the Facebook page in it. Same deal, you can post it up to 3 times a day!